Blankenship was convicted in December of conspiring to willfully violate federal mine safety laws — a misdemeanor. The charge stemmed from an investigation into the April 5, 2010 explosion at the Upper Big Branch Mine near Montcoal that killed 29 men. “You should be someone that we are able to tout as a West Virginia success story. Instead of being able to tout you, we are here,” said Judge Berger to Blankenship while delivering the sentence. “I feel badly for them. 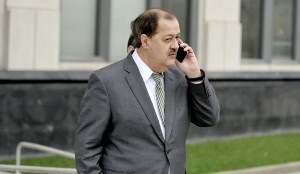 It’s a lot of emotion and that’s understandable,” Blankenship said to reporters. “We’re obviously glad that that this process has come to an end. It’s been a long time coming and we’re glad to come to the end of it,” said Taylor, as family members of Upper Big Branch vicitms shouted at Blankenship and his attorneys. During a short recess Wednesday morning, Betty Harrah, who lost her 40-year-old brother Steve in the blast, expressed her frustrations over Judge Berger not allowing victims’ families to speak at the hearing. Sherry Depoy’s brother “Boone” Payne was another victim at Upper Big Branch. “I’m feeling a little a bit better than I did after the verdict, you know? Hearing the judge say the things that she said — that he was guilty of different things. [As for] Blankenship, I almost walked out because I didn’t want to hear him talk. I don’t want to hear anything he has to say,” said Depoy. “I hope they don’t grant him the appeal. The only thing would’ve been better [would have been] to see him come out in handcuffs,” she added. “We are very happy. I think all the families are very happy that she gave him what she was allowed to give him,” said Quarles. Manchin has introduced a mine safety bill that includes increased penalties for those at the top of the corporate later, but in the almost full year since it was introduced, it hasn’t budged in Congress. This report first appeared on West Virginia Public Broadcasting’s website. Dave Mistich and Ashton Marra work for West Virginia Public Broadcasting.